LMBC is proud to have gathered three highly regarded organisations together so we can offer our members specific 2 hour skills sessions. Note - These sessions are brought to you at a reduced cost and are at this stage are ONLY available for LMBC / MTBA full members or children of members. MTBA membership cards must be presented on day along with your booking receipt. Note - 2 months free membership currently offered by MTBA doesn't count for this special! PLEASE NOTE - No refunds for cancellations will be given if less than 4 days to go. Transfer are possible, if you arrange. Unless tracks are closed, sessions will go ahead. Bring a raincoat! Cost - $50 - pay at time of booking only! Fundamentals - Basics for beginner that can ride a bike. These sessions will be held on green trails with no obstacles. Focus will be on trail balance, cornering, correct gear sections and turns. These sessions will use Hollybank's new blue trails and look at picking appropriate lines to maintain speed and clear obstacles with the least amount of effort / fear! Will include looking at your riding / using the bike as opposed to just handing on and peddling. 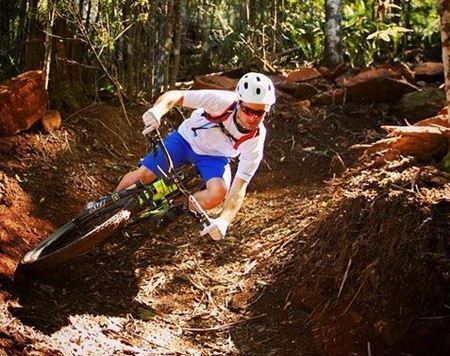 These sessions are for those that what to get the most out of their dual suspension bikes. Participants must have basic fitness and solid bike skills. A few loose marbles may also help. Only kidding Rob! NOTE - Bikes need to fully functional - with working front and rear brakes and gears. Helmets must be work BUT lycra is optional!